This is one app I truly love, and use almost daily! One question though .. is there a way to enter quantity? Say I want to add 4 cans of Tomato Soup .. can I chafed the quantity for pricing? Hi Dave, thanks so much for your feedback. Sure, you can change item quantity under Edit item tab in the top-right corner. 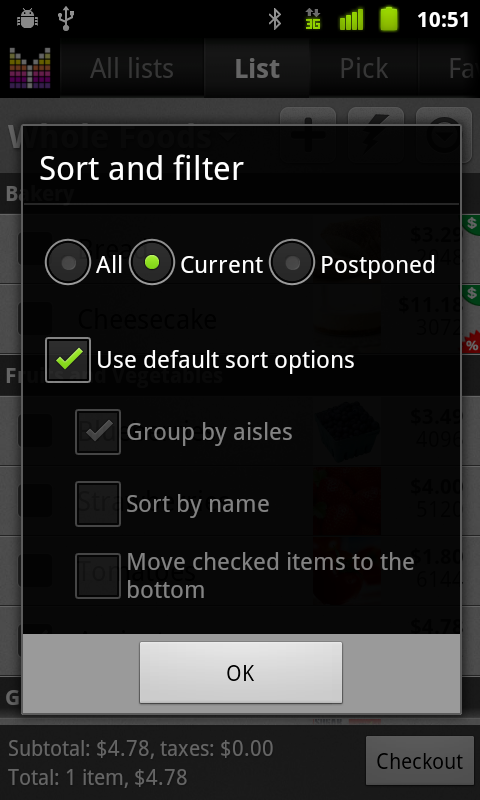 I have the option to put items into categories clicked, yet it won’t put items into categories. it just males one huge list. Hi Katie, thank you for your question. Most likely you need to change Master list setting to OFF. Please see this Frequently Asked Question. Is there a way for the list order to be the same as my check-off order from the last visit to that store? That would be a huge time saver. Other than that the app looks good. Hi Bruce, thanks for your question. Yes, just go to History, long-tap the record which corresponds to your last trip and select “Add to list”. You may also want to select items you’d like to add to your shopping list by expanding a group and tapping the items. What are HOT DOGS listed as? No prob finding HOT DOG BUNS. Hi Sue, thanks for your question. I don’t believe there are Hot Dogs on the predefined catalog. But you can easily add it by tapping add button (Plus). Just purchased the app and love what I see. Just have a couple of comments. First, I am in Oregon. We have a 5cent deposit on all cans and bottles. It would be kinda nice if there was a way to add that. There is no sales tax in Oregon, and i did not see how to specify a fixed dollar amount in the tax field. There may be other situation where you need to add a fixed additional fee on top of any taxes, where this may come in handy. Second, and maybe I am doing something wrong, I just find it combersome when having to specify that i want 2 of one item witbout having to edit the actual item itself, each time i make my shopping list. Hi Daniel, thanks so much for your feedback. We are considering adding cans & bottles deposit feature. In the meantime you may want to try using Coupon field and put “minus 5 cent” fixed value. As for changing item quantity quickly, I’d recommend using the Quick edit mode in the shopping list. “Quick edit” option is available on the sidebar of a shopping list. Great app! But now When I send something to the cart the list goes back to the top instead of staying where I was on the list so I have to scroll back through to find my spot. It didn’t used to do this. Is there anyway to change it? Hi Caroline, thanks for your feedback. Kindly note there were no changes to the app recently therefore I suspect there’s something in your phone which caused it. Has your phone received a software update recently? Also I’d recommend trying to reboot your phone. Thank you. Your application is so good.I really like to use it. I have a small problem … I hope you can help me. I really like the voice feature to add items … I do it in Russian. The problem is that the program does not recognize multiple products. Maybe you should add to the program settings the ability to determine the Conjunction “and” in other languages. Hi there, thanks for contacting us and letting us know about the problem. Indeed, there is no way to add multiple shopping list items using voice in other languages. This fix is scheduled for the next update. Maybe a simple enquiry. 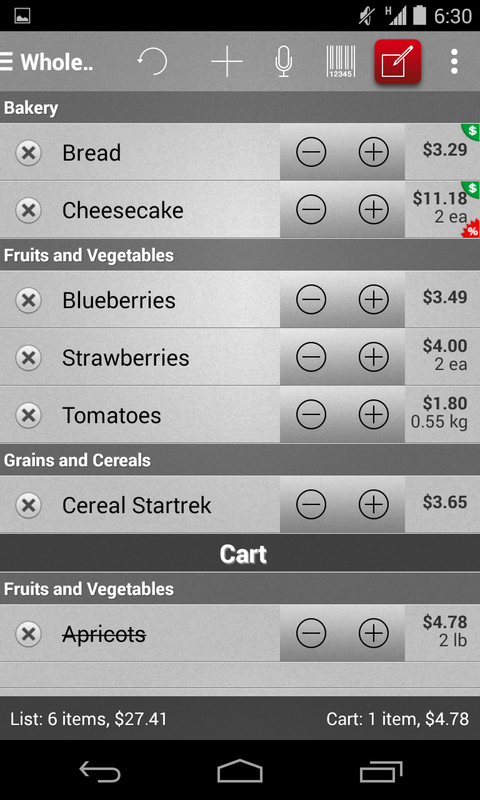 New to Mighty Grocery, I have set up a Master List as suggested (groceries) and link to 2 stores which works fine. Question 1. Is there a way to delete an item from the current (store) list without deleting from the master list (and other linked lists. Question 2. What is the signifigance of the yellow triangle on some list items. Kindly note that there is no way to keep item on master list without getting it listed under every sublist. 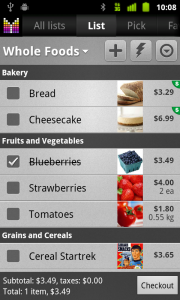 However this may be possible later, when we allow assigning an item to multiple shopping lists. As for yellow triangle, it is just an indicator that item has a comment. Is there any way to compare prices before I shop? My iphone had a grocery app that stored prices by store which would allow me to remember which store had the best price for any specific ifem. Hi Vince, thank you for your question. Unfortunately, there is no way to compare prices in MG yet. However, price compare feature is planned later this year. Kind of a show stopper for me. One of the things you have that a lot of the others are lacking is per unit pricing – however that’s semi-useless if it’s not kept by store. I’ll check the program out again when you’ve added that. BTW, the unit cost could use two more decimal places to keep the final cost more accurate – for example, I added 170 units for paper plates at $14.79 from CostCo. Unit price calced to .09, however that jumped up the final price. Maybe an option to always calc unit price but not affect final? 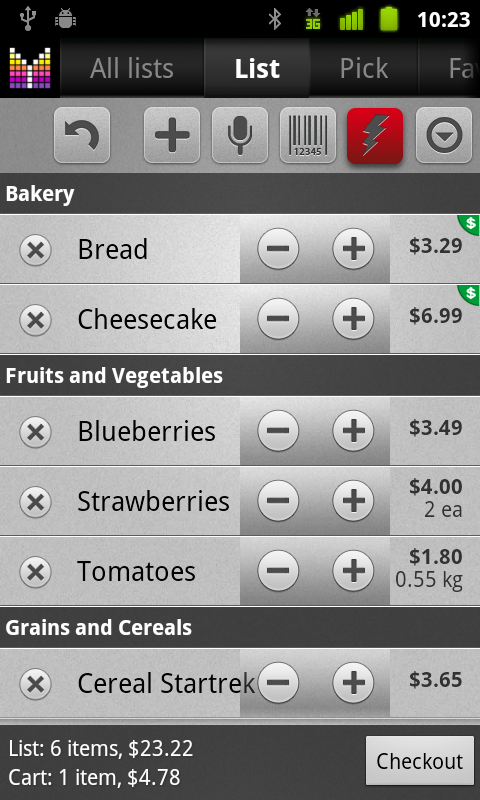 The point is of course to have a good unit cost to quickly compare when I’m at the store (like per oz, per plate, etc). Anyway I like the app – few more tweaks and I’m sold. Hi Nick, thank you for your feedback. Kindly note that compare store prices feature is planned later this year. As for Unit price rounding, this is under consideration for now but it should be planned for implementation soon. Just returned from a shopping trip and need to add items to the List. But the + (plus) button does not appear anymore. 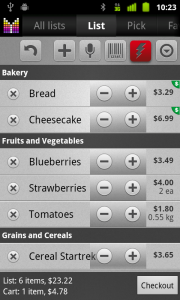 I tried some of the other functions such as Ingredients which also have an add item capability but the + button is not there either. I thought I may be running low on internal phone storage so I created a backup and then moved MG to the SD card. No luck. Kindly note that when you long-tap a toolbar button, it is moved to the Sidebar. Just tap the button in the top-right corner to open Sidebar and long-tap the Plus button to move it back to the toolbar. For more details please see Getting started User’s Guide. I feel like such a jerk for panicking over such a simple thing once you explained it! Now I can go shopping! No problem. Feel free to contact us with any questions or comments.